The weather is changing and summer is just around the corner with temperatures that will touch 40°C and above. According to health experts, it is the time of the year when people are most at risk of heat stroke and dehydration. And so, it is important to cover up, stay indoors in the middle of the day and drink as much water as possible. The experts say that it is essential to stay hydrated irrespective of the weather. However, in summer, since the body loses more water than usual, it is necessary to take extra care regarding one's water or fluid intake. "Fluids carry nutrients to your cells, flush bacteria from your bladder, maintains fluidity of your joints and prevent constipation," said Dr Wafaa Ayesh, director of clinical nutrition at the Dubai Health Authority (DHA). "Dehydration can have a noticeable effect if you lose as little as two per cent of your body's water content. Fluid balance is crucial to staying healthy and maintaining the function of every system in your body, which includes your heart, brain and muscles." According to Dr Wafa, water is almost the best hydrating beverage. "But you also don't want to over hydrate as it can water down electrolytes. It's important to remember that some beverages can be dehydrating if taken in high amount," she said. "While hydrating drinks tend to have a dilute amount of carbohydrate, salt and potassium, rehydration drinks will tend to have about 6g carb per 600ml and a small amount of salt." 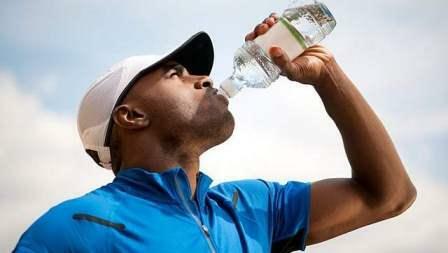 Yet, no other dietary strategies enjoy the reputation of proven performance and health promoting benefits as the consumption of water, she added. "Besides water, there are certain fruits and vegetables that can also fulfil your fluid requirements and provides you with vitamins, minerals, fibre and protein," said Zeina Younes, clinical diabetes dietitian specialist at the Dubai Diabetes Centre. During summer, exercise needs to be well planned and accommodated for water losses. If you are exercising, it is recommended that you still aim for two litres per day plus an extra 250ml per half hour depending on the heat. It has the highest water content of any lettuce at 96 per cent. It is also cholesterol and sodium free; followed by butterhead, green leaf and romaine varieties. High in water with 95 per cent water content, it is also low in calories and helps in curbing appetite. In addition, celery contains foliate and the vitamins A, C, and K.
They are filled with antioxidants such ?as catechins (which are found in ? green teas). They are also rich in lycopene, a cancer-fighting antioxidant. They have a higher water content than their red and yellow counterparts at 92 per cent and contain antioxidants such as Vitamin C, thiamine, Vitamin B6 and folic acid. It is also rich in antioxidants, such as epicatechin, which is a heart-healthy compound found in dark chocolate and green tea. Contains 90.2 per cent water and also provides 100 per cent of the daily-recommended intake of vitamin A and C.
Contain 90.4 per cent water, more water than full-sized carrots. The ready-to-eat convenience factor is hard to top, as well. Reported to have a positive effect on blood cholesterol levels. Rich in fibre, potassium, vitamin A, and vitamin C, broccoli is also the only cruciferous vegetable containing a significant amount of sulforaphane, a potent compound that boosts the body's protective enzymes and flushes out cancer-causing chemicals. Strawberries contain 92 per cent water followed by raspberries and blueberries that hold around 85 per cent water, while blackberries are only slightly better at 88.2 per cent. The leafy green is made up of 92 per cent water, and is also rich in lutein, potassium, fibre, and brain-boosting foliate. Moreover, one cup of spinach leaves contains 15 per cent of your daily requirements for vitamin E.
It has a high water content, contains readily available glucose and potassium and is also rich in the antioxidant lycopene. It is rich in vitamins and phytonutrients and has been shown to have beneficial effects on cholesterol levels and on lowering risk of certain cancers.